Prince Harry is to receive an award in recognition of his charitable work supporting servicemen and women. The distinguished humanitarian leadership award will be presented to the 27-year-old prince in Washington DC in May by the Atlantic Council. The prince has chosen to accept the award on behalf of himself and his brother, the Duke of Cambridge. The princes set up the Foundation of Prince William and Prince Harry in September 2009. The Foundation has already this year announced it will work in partnership with the Forces in Mind Trust, to support former British military personnel and their families with the transition to civilian life. Prince Harry - a serving captain in the British Army - publicly supports charities such as Help For Heroes, ABF The Soldiers' Charity and is a patron of Walking With The Wounded. In March 2011, he joined four servicemen on the first five days of a mission to trek 200 miles (320km) across the polar ice cap to the north pole. On his return from the Arctic, the prince described the experience as "a lot harder and colder than any of us realised." He added: "All the credit here goes to the lads who have weeks more of trekking to get to the north pole. Their strength, motivation and stamina is out of this world." Harry announced plans to expand his Sentebale charity last month. The group currently helps disadvantaged children the southern African country of Lesotho, but will soon carry out projects worldwide. In a statement, St James' Palace said: "Prince Harry will use the award to pay tribute to British and American veterans' charities for their achievements in helping to rehabilitate wounded servicemen and women, and to reintegrate those who have served in the armed forces into civilian life." 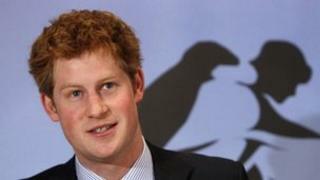 Prince Harry will accept the award at the Atlantic Council's annual awards dinner on 7 May. The council promotes transatlantic co-operation and international security, and is celebrating its 50th anniversary this year. In February 2012, Prince Harry qualified as an Apache helicopter pilot after 18 months of training in the UK and US.